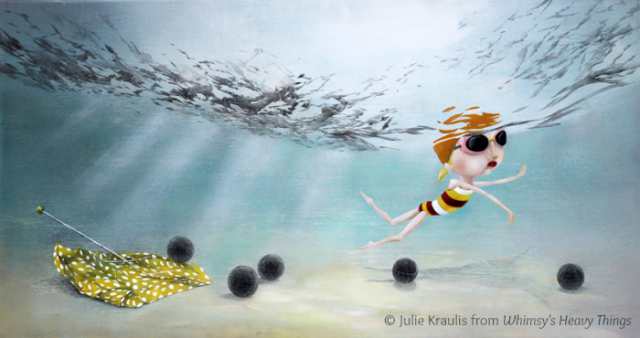 I recently had the pleasure of sitting down with the extremely talented children’s book author and illustrator, Julie Kraulis. Julie is an old childhood friend; our mothers were best friends growing up. I stumbled across Julie again on facebook and was absolutely blown away by her talent. After a lunch filled with reminiscing and comparing life as artists we dove into discussing her wonderfully deep children’s book. 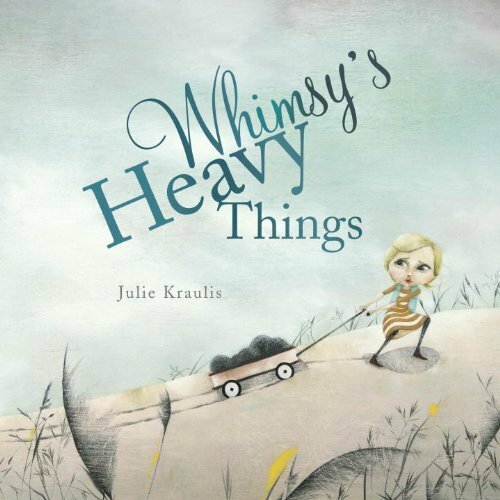 Julie recently wrote and illustrated Whimsy’s Heavy Things, which was published by Tundra Books. Whimsy’s Heavy Things had a huge impact on me because it truly hit home in a lot of ways. The premise of the book is the main character has “heavy things” which is symbolized by actual physical black spheres and these spheres will not leave her and are weighing her down. She tries to find ways to get rid of them but it proves impossible until she actually faces them head on. The beautifully delicate yet intense style Julie brings to the illustrations brings this story to life in an incredible way. Julie said that Whimsy’s “heavy things” could be interpreted in many different ways; it’s all about what the reader relates it to. I related the heavy things to a couple different heavy things in my life. My son Holden can tend to feel a little more anxious than most kids and for a long time he had his heavy things following him around, even when he was a baby. But in the past year or so we have really started to break down his anxiety and deal with it head on. Since then he has been so much lighter and has realized that life is meant to be enjoyed and can be fun and exciting. Whimsy’s Heavy Things could relate to so many different life obstacles for both children and adults. 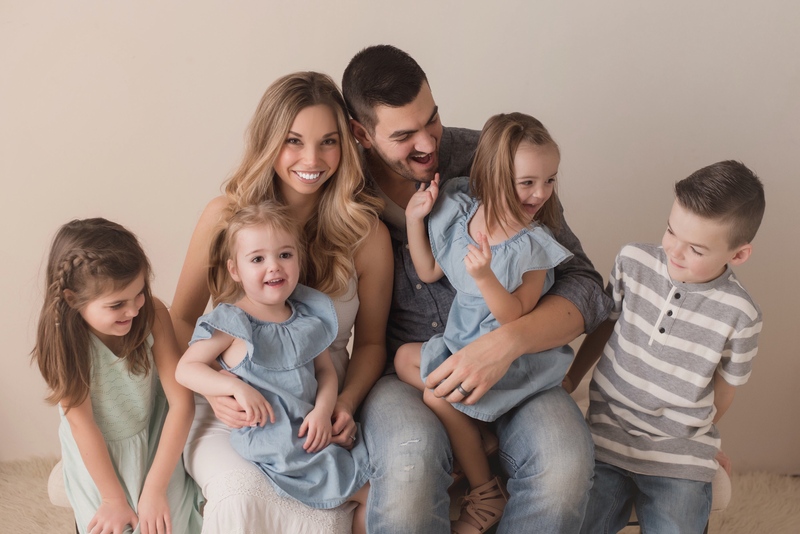 Whether it’s deep loss, anxiety or something that is just nagging at you Whimsy’s Heavy Things will be an incredible eye opener of how you can look at your heavy things in a very different way. Julie was kind enough to sign a copy for me to do a giveaway… just in time for Christmas! All you have to do is LIKE Nesting Story on Facebook and share the Whimsy’s Heavy Things giveaway photo to be entered. It’s that simple! A name will be drawn and announced at 11:00AM on Friday November 29th. Good Luck! If you don’t win, I highly suggest picking up a copy for yourself or as a perfect Christmas gift on Amazon. Visit Julie online at www.juliekraulis.com and on Facebook.